Khan Tengri was up to now the most difficult 7000 m peak that we climbed. Together with the bad weather in the region, it offers a high frustration potential especially to beginners in the world of expeditions. Those who want to climb a high mountain and maybe even want to have some outlook from the top, should definitely go elsewhere than to the Tien Shan. The only argument might be the nice sound of the mountain names here. Tien Shan is Chinese and means Heaven Mountains. Khan Tengri means Ruler of the Skies. Kazakhstan's surface of 2.7 million km2 makes it the second largest country of the CIS (former Soviet Union) and the ninth largest of the world. The country is generally sparsely inhabited (17 million inhabitants). Official capital is Astana (that means "capital") which was re-named from Aqmola (or, even before, Celinograd) in May 1998. Actually, the country's metropolis is Almaty, being situated on the southern edge of the large plain of Lake Balkhash and Lake Aral. The mountain range south of the city offers water for irrigation. Kazakhstan has only a very small share of the "true" Tien Shan range, about 200 km east of Almaty. The population consists of 45 % Kazakhs and 35 % Russians. Official language is Kazakh, a language related to Turkish, but written in Cyrillic letters. Since the most Kazakhs also speak Russian but only very few Russians also master Kazakh, the Russian language remains important. Currency is Tenge; 45 Tenge correspond to 1 DM, 75-77 Tenge to 1 US$. The exchange rate to DM had not changed from 1995 to 1998. A typical university employee salary is about 80-100 US$. Correspondingly, prices for basic food are lower than in central Europe; for luxury products, however, prices are comparable: One liter of Coke or other soft drink costs 60-80 Tenge, a lunch in the restaurant 250 Tenge. We booked this trip at DAV Summit Club (Munich, Germany). It is one of the "expeditions in new organization style" which were carried out in this form the first time this year. The idea is to offer infrastructure to somewhat well-established mountaineering groups without an accompanying German mountain guide. Originally we had planned to climb both Khan Tengri and Pik Pobeda, having 42 days in total. It does not make sense to book a trip directly at Khan Tengri Mountain Service like those offered in the Summit Club catalog, since it wouldn't cost considerably less - except one would like a more individual program. Available maps are rather poor, and the high camp heights (e.g. given in Summit Club Catalog) are wrong at all. Base camp Inylchek North can not be at 4000 m altitude, because then all mountains would become about 200 m too small. Calculating back from the summit (7010 m), the heights become more consistent with camp 4 (6400 m), camp 3 / snow caves (5800 m), Peak Chapaev (6100 m), camp 2 (5500 m), camp 1 (4750 m), lower camp 1 (4660 m) and base camp (4200 m). Nevertheless, an error of up to 100 meters can not be excluded. The height of Khan Tengri is sometime given with 6995 m, sometimes with 7010 m. Having seen the situation directly, I can support the following explanation: It was a (so-to-say) "surveying habit" in the USSR to mention the uppermost solid point of the mountain as official height, i.e. the last rock where the survey marker could be permanently fixed. This marker is situated at 6995 m at Khan Tengri. Behind this marker, a cornice rises up about (depending on the season) surely 15 m, giving a total height of 7010 m - that is the real height of the mountain, but still being ignored by the geographers. The route follows the crest on the right side of the big valley that leads to the west saddle of Khan Tengri to Peak Chapaev North summit and from there to the west saddle and via the west ridge to the summit of Khan Tengri. From base camp Inylchek North, one crosses the glacier in direction southsouthwest and ascends through the slopes right of the above mentioned crest. The passage through a crevasse zone lies quite far to the right. After this crevasse zone, it goes diagonally up to the left (crampons often advisable - ice or only very few snow on the glacier ice). Some crevasses, easy to cross; now directly up until one can go left onto a small terrasse under a crevasse where the first fixed rope starts. This leads straigt up on the ridge; where the ridge stops rising, the "lower" camp 1 is situated at 4660 m. Ascent 3 hours, descent 1 1/2 hours. 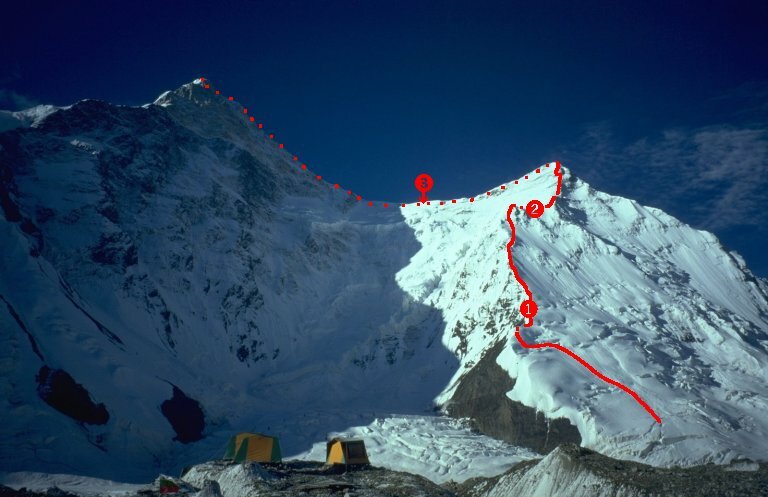 The "upper" camp 1 is reached from there in 15 to 30 minutes; normally crampons are needed at the first steep slope. From here on one follows the fixed ropes that guide continuously along the ridge tp camp 2. Camp 2 (5500 m) is situated on a glacier plain behind the big rock where the ridge curves to the right. On the ridge there are two a bit more difficult portions, which are, however, well secured by the fixed ropes, needing only some physical effort. Ascent 4-6 hours, descent 1 1/2 - 2 hours. From camp 2 following the snow crest towards the first rock step. This (rather difficult) step is climbed with with help of fixed ropes. Crossing snow/scree slopes (falling rock along this whole section) to the second more difficult place and then on the steep snow flank to Peak Chapaev's northern summit. From here descend along the snow ridge to Khan Tengri west saddle, with respectful distance to the cornices of the north side. At one crevasse in the upper part a rope is fixed; elsewhere no larger crevasses. The place for camp 3 is the first flat on the west saddle, and the snow caves are exactly south of it about 20 height meters below. Shortly before camp 3 the other trace comes up from the south side; the Kyrgyz snow caves are down right. First on the broad ridge, often on a trail, until thei ridge gets steeper and steeper. The way back can be hard to find especially at darkness and/or snowfall; think about marking it during the way up. The first steep cliff has a fixed rope, then on the trail a flatter section (possible tent site). Soon the continuous fixed ropes begin; at 6200 m a very small possible tent site. The route leads on the right side of the crest through a stepped terrain with some sections II, sometimes more difficult. At 6400 m there's the place for camp 4, where one tent can be put quite well. The site is very wind-exposed and in the shadow until 11 a.m. The way goes up another 150 height meters close to the ridge, then traversing rightwards under the big steep rock cliffs. After climbing up a little gully (II, steep, quite solid rock) one enters a funnel-shaped snow couloir, stretching to the right (quite steep, and exhausting due to the height), where the WSW ridge is reached. Another steep step is secured with ropes, after that there are rock-spotted snow slopes, slowly reducing inclination. End of the fixed ropes; keep in mind well where the rope begins. Ascend following the ridge (ice axe or ski poles are good to have, especially for the way back), until it doesn't go higher; on the right side there is the surveying marker 6995 m.
Descent takes long and costs a lot of concentration. In some sections, climbing down is recommended (especially where the ropes are severely damaged), mostly rappelling is better. The rope at the last rock step is very bad; in the traverse below the couloir a lot of knots. The upper part of the crest is well suited for rappelling, but around camp 4 the ropes are in bad condition. Further down there are often knots in the ropes. Rappelling is best with figure of eight, or with what I learned as "Karabinerbremse" (literally: barabiner brake, consists of two crossed karabiners. Maybe anyone could tell me an appropriate English term for that.). The figure of eight often makes problem on the damaged parts of the rope where the mantle is missing. The karabiner brake is better to move over these spots, and one can get small knots through, too. The terrain is never so steep that one would hang freely (then the karabiner brake would be forbidden due to its smaller slowing effect). Between Peak Chapaev and camp 2 the ropes are quite good, only few disturbing knots. Attention to falling stones, if many people go down at the same time. Between camp 2 and camp 1 the ropes are - especially in the lower section - so strongly tightened that the figure of eight can hardly put onto them. Either one carefully goes down (flatter sections) or uses the karabiner brake (steeper sections). The route from base camp to Khan Tengri; the summit at the right is Peak Chapaev. From there to the summit, the route follows the other side of the crest. The information given on this page is current for August 1998.